Soldier and student among the suspects arrested. Guns were hidden in dorm room and baby's crib. Israeli police arrested 18 suspects overnight during a major operation to break up a smuggling ring involved in the sale of illegal drugs and weapons. After compiling a body of evidence against the suspects, who were spread out across the country, police arrested 18 individuals believed to be involved in the smuggling operation. The suspects included a soldier and a female college student, who authorities claim used her dorm room as a transfer station for smuggled weapons. Police believe that the weapons were destined for organized crime syndicates within Israel. During the pre-dawn raids hundreds of police searched through the homes of the 18 suspects, revealing large caches of firearms, explosive devices, and hard drugs. 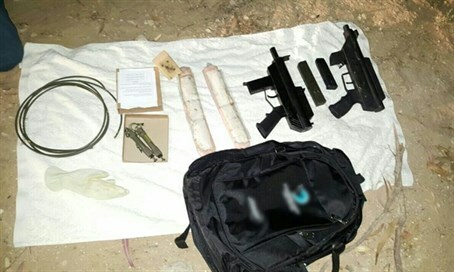 In the course of the investigation, Israeli police also discovered a group of illegal weapons dealers operating out of Sderot and the Bedouin town of Rahat. Police believe the network included two young Sderot women, one of whom is a college student. The student allegedly used her college dorm room to store explosive devices slated to be sold to large criminal syndicates. Police also revealed that Carl Gustav submachine guns, purchased from Arab gun dealers in Kfar Kassem and Hevron, were in some cases concealed in baby cribs.